← I like everything cycling. Learning this blog thing for more interesting content. 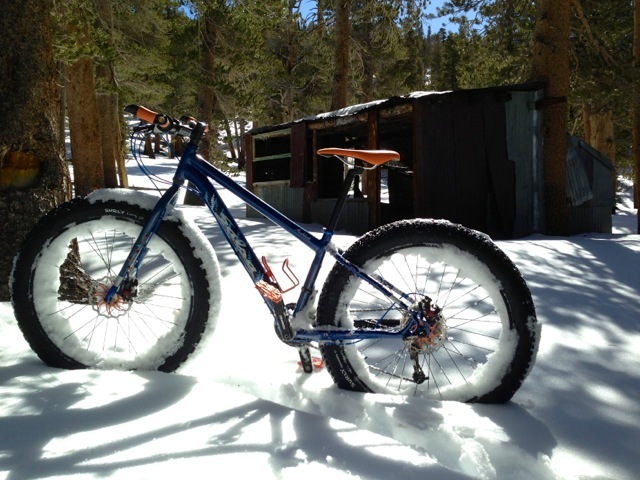 Rewind back to 2012, A buddy and I bought Fat Bikes around November of 2012 never meet each other before we had fat bikes but until we found out we where not allowed to ride are bikes on groomed cross country ski runs did we decide to unite. 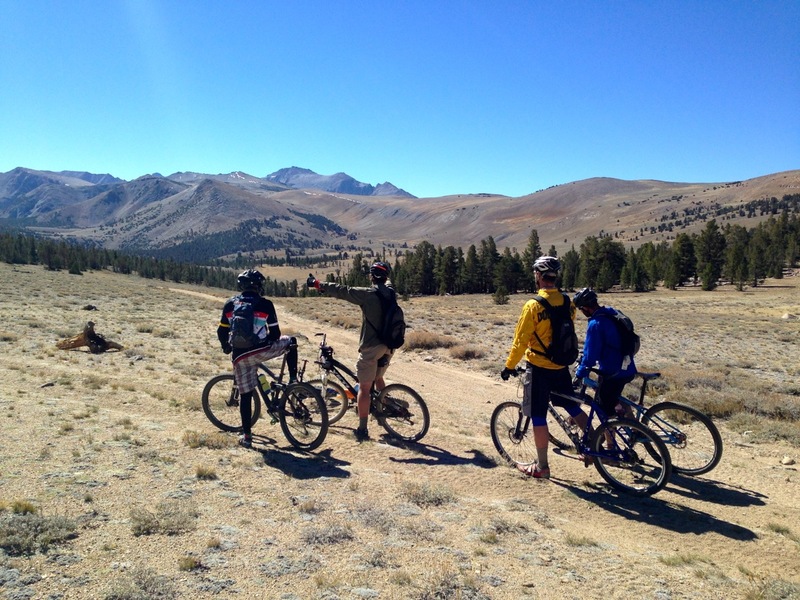 We later found out that we had the same interest in what we use to call mountain biking now we call Adventure biking. I say this because in the early years before Bike Parks and organized mountain bike groups that went out and built beautiful groomed flow trails you would pack a lunch, go out find a strip of dirt or animal trail no matter how over grown it was you would ride it or hike a bike it. 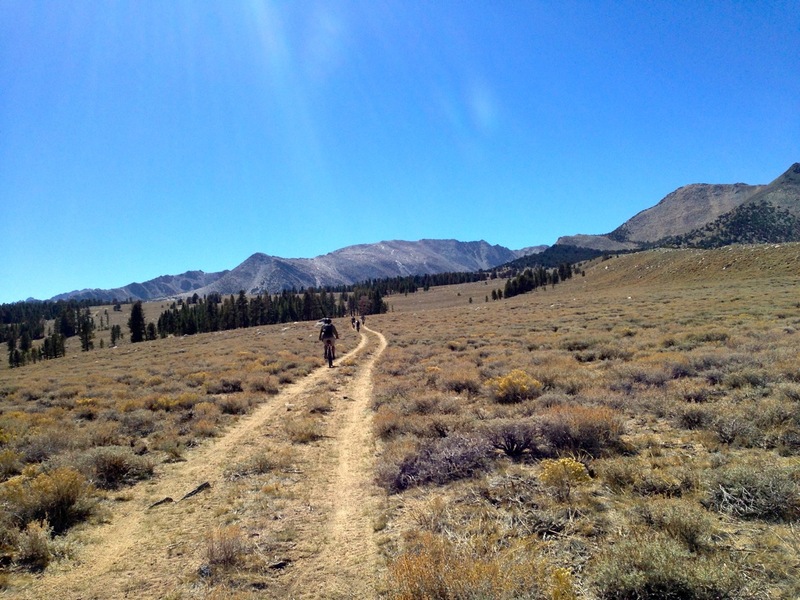 ok so any way Alan and I had talked about heading out on some big adventure rides he mentioned the coyote traverse part of a legendary race I had heard about The Sierra 7500 which caught my attention looked up the route in the guide book Mountain Biking Mammoth & the Eastern Sierra found all the details. 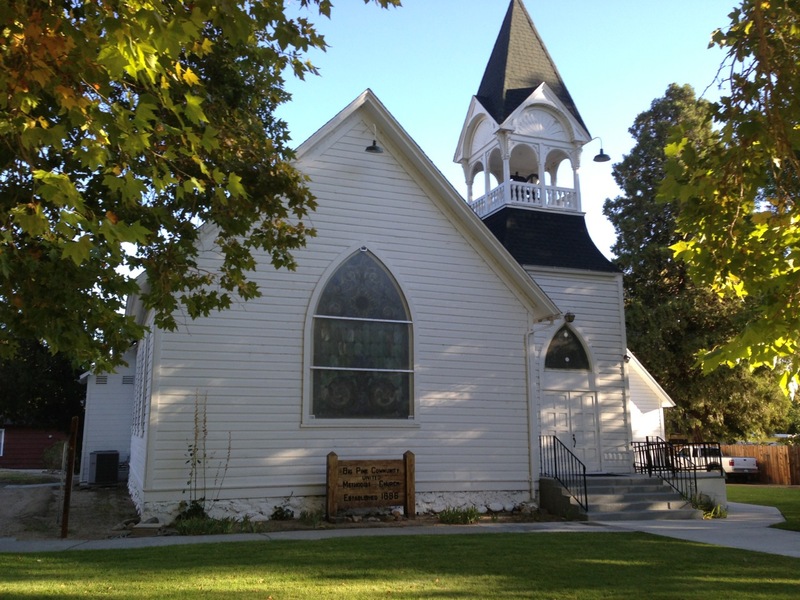 On Febuaray 2012 We drove to Big Pine dropped a car off on W. Carver Street in front of a church built in 1896. Then drove up to Parchers resort when its open a great place to grab a drink or a bite but it was closed for the winter. The trail starts at 9,250 feet The day started in the morning around 28 degrees F we headed up a gravel road over a bridge which is on Private Land there is a fence there but a walk around up to a sandy double track perfect for Fat Bikes probably around 500 feet of climbing we started to hit snow which was packed down nicely from snowshoers and the snow was nice and firm to ride on due to the temps. We hiked thru the snow another milish we where only moving about a mile an hour we started to realize that we where running out of daylight and we where not going to make this ride and we might endanger are self’s so we decided to turn around and make this a fall trip before the snow flies. 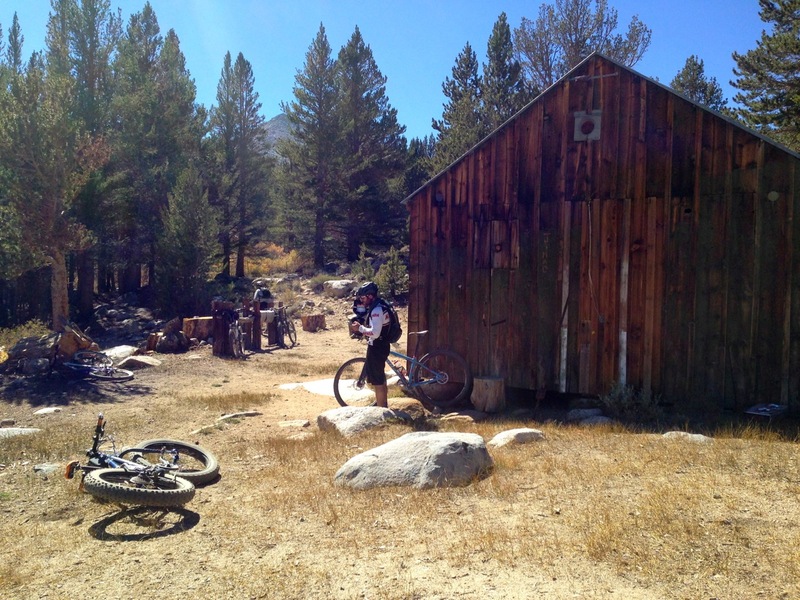 so fast forward to October 3rd 2013 Alan, Myself invited John and Jeff and left Mammoth at 7am drove back to the historic church and dropped a truck off and headed back up to Parchers resort where we meet up with Jeremy who we talked to thru Strava to get this #ridebikeswithfriends ride started. The morning was a cool fall day I ran inside Parchers to grab a red bull and we all suited up for what began a 12 hour day. 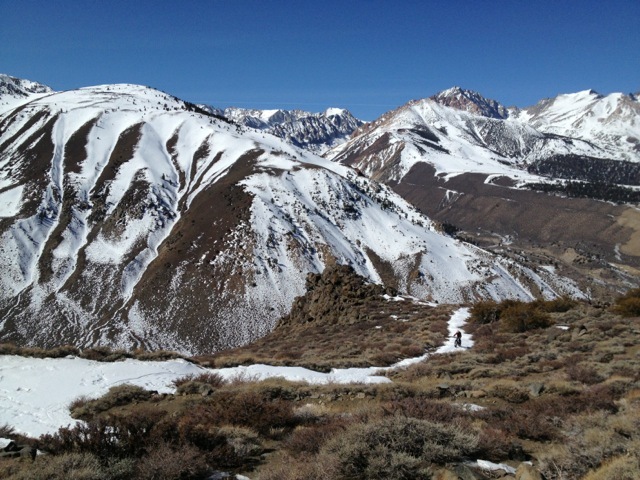 Now that the snow had melted the Double track was a bit of a sandy climb with traces of deer tracks. 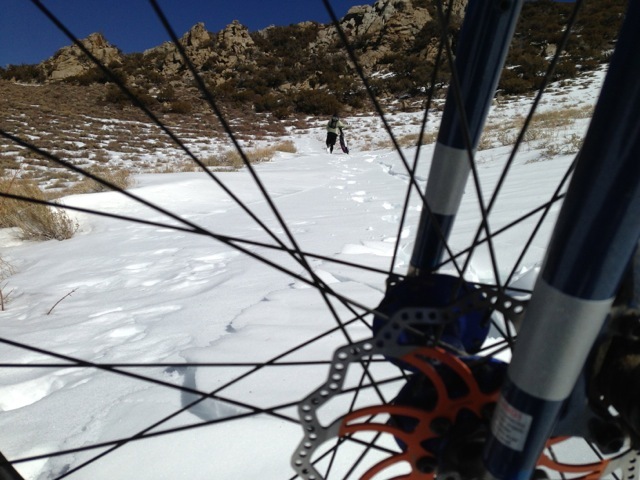 I took my fatbike for this ride again, thinking glad I did since it was a bit soft. The climb was steep with breath taking views after awhile of climbing we had a slight downhill to a run down hut of sorts all five of us stopped for a break to check it. After eating some snacks and yaking it was time to move on. The road started to climb, this climb became steep hike a bike style. Two Thumbs up for this view. unreal!!! We came to a service road that was semi flat and rolling I started to get dropped a bit thinking hum wishing I had my hard tail 29r. We hit this great double track. 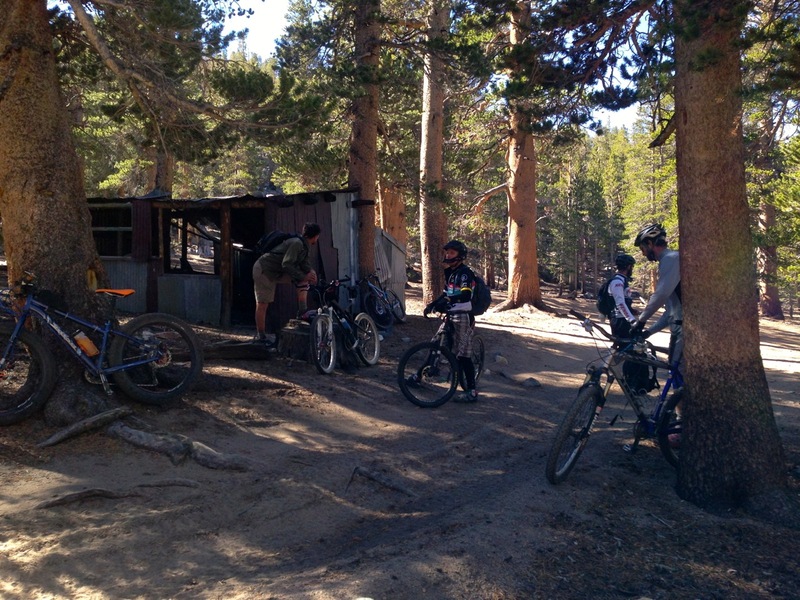 Then a nice fast rocky downhill where i was loving my fatbike again especially after Alan and Jeremy got a flat. They got there flats fixed and headed on a service road that is used by Rhinos often. 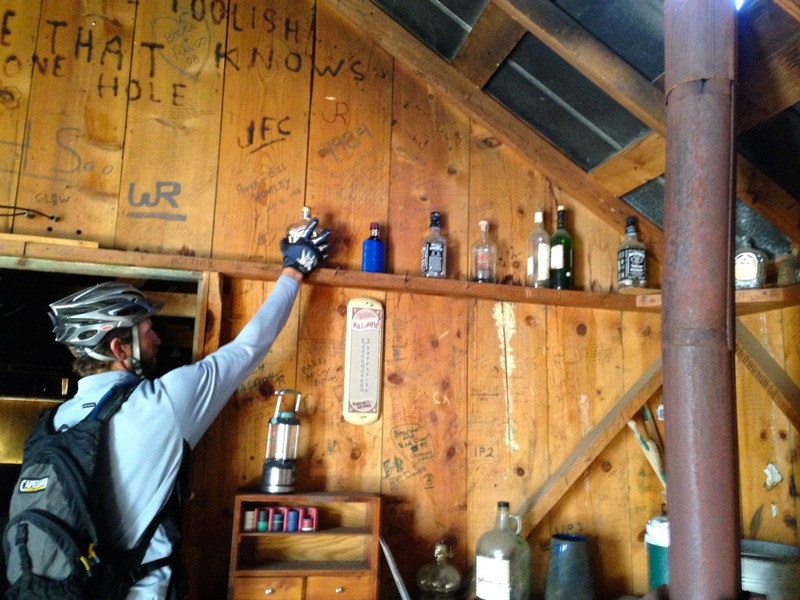 We found Baker Cabin which was pretty cool there was a bottle of Crown Royal Whiskey which I like so Jeff and I took a swag a piece, good stuff!!! It was great because here is where the true Adventure began for most of us to find the single track that would take to Glacier Lodge and then back down the 9 mile fast fun road back to the truck. 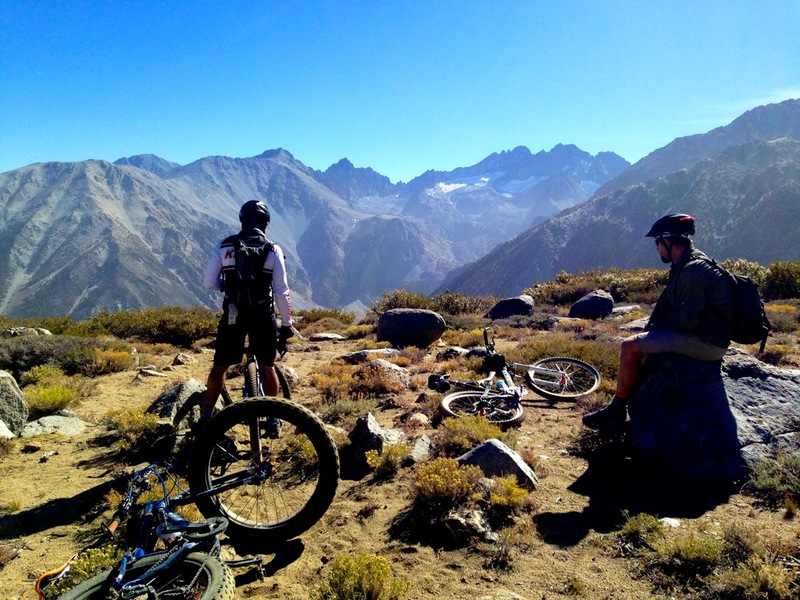 A killer view of the Palisades Glacier one of the Major Highlights of this ride. The single track (which my Iphone died so I was not able to take any photos) had probably not been maintained in about 20 years. The first mile was a little hard to find but someone did stack rocks up to show you the way. For me when the trail was a little more defind I was having a good time because the fatbike was like a slow moving tank just rolled over stuff. Just before the steep sandy single track out to the road we saw probably about 30-40 deer that was pretty freaken awesome. I never get tired of seeing wild life. 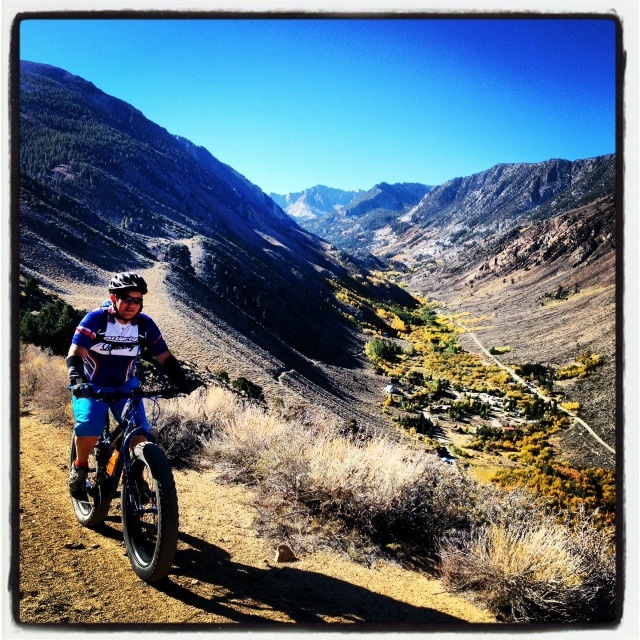 So after the Sandy singletrack that I would just float over on my fatty it was a fun 9 mile road ride back to the car..
We where all so Hungry we stoped at the Burger Barn in Bishop and you could feel your body just absorbing the food. 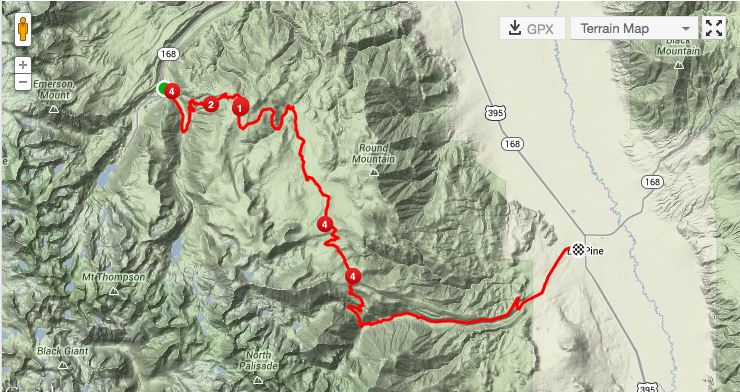 What a day it was almost a backpacking trip on two wheels a Sierra Epic ride for sure!!! 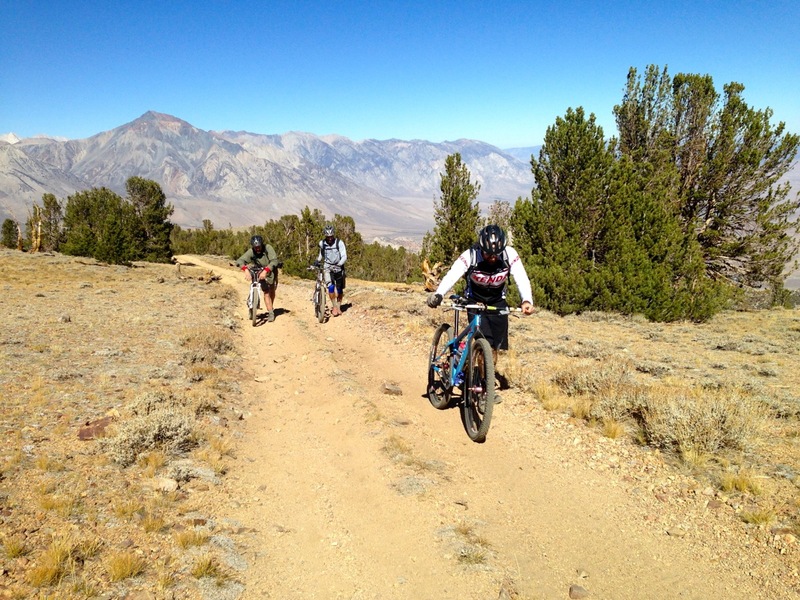 This entry was posted in Mountain Bike Trail Storys and tagged bishop, Burger Barn, Coyote Traverse, eastern sierra, fatbike, mountain bike, Mountain Bike Bishop, Mountain Bike Eastern Sierras, Mountain bike Mammoth, ridebikeswithfriends, vistas. Bookmark the permalink.